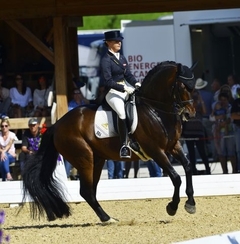 Augustin clearly won the Grand Prix Freestyle qualifier at the Shindlhof in Fritzens with 75,80 percent. I am especially pleased with this result because we gave Augustin a longer break from competitions after he did so well at the World Equestrian Games in Caen/FRA and this was his first test in the dressage ring again. It was so much fun to ride him – in spite of a thunder storm with rain that was just starting. He was full of energy and rearing to go but very attentive and on the aids and this was rewarded with individual scores up to 9.0. Little wobblers showed that we need to improve our fine coordination a bit - and that there's still room upward. I was also extremely pleased about my own scores - I received 9.0 for my position and seat as well as for correctness and effectiveness of the aids. Not bad!